Right now when I am logged in, I can see the portal. When I am not logged in (guest), then the portal is not visible. I have set the permissions correctly for all the groups and also for the user 'Anonymous'/guest. What portal version do you have installed? I installed the customized version from the link you sent. If I enter this address in the browser "https://www.golfgtiforum.nl/forumportal/app.php/portal" will be directed to the index page. The permissions are not set correctly. I also purged the cache. Still not working. Klick on " Select anonymous user", klick "View permissions"
Your home link go to: "https://www.golfgtiforum.nl/forumportal/app.php" this is not correct. Maybe another EXT will cause these problems. Check if these changes are present in the files. 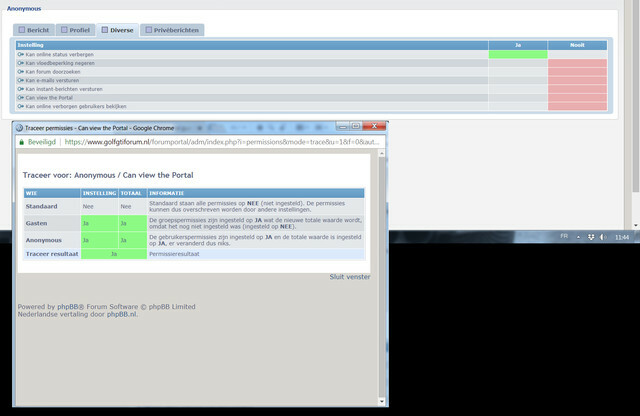 Install the portal extension on a test board and check if it works there. The only other extension I have is Tapatalk. All the changes are present in the files. Same problem on different board... this is driving me crazy. edit: seems that disabling the tapatalk extension solves the problem. Any solution to get tapatalk working with board3?